Mike Chamberlin has been singing as long as he's been talking. Mike interviews and sings to two of the eight remaining Munchkins from "The Wizard of Oz." Musical parents influenced Mike at an early age and by the time he was in grade school, he was already performing. By high school, he was entrenched in Rock 'N Roll music and signed by a record label. Mike's road to Rock 'N Roll stardom took a left-hand turn when he was drafted into the U.S. Army. 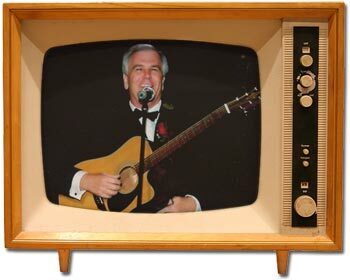 He served a tour of duty in Viet Nam and then resumed a music career that led to a gig as a radio DJ and eventually into TV news anchoring. Mike has been performing professionally for almost 50 years, and continues to perform for the 55+ communities in the West and Southwest. On this Web site, you'll find information on how to book Mike and how to order his CD, as well as the places he's played and celebrities he's performed alongside. Mike Chamberlin joined KTVK-3TV in 1988 as the primary sports anchor. Fifteen years later, the station moved him into the primary news anchor position. In February 2006, he moved across town to KPHO News 5 as the morning and noon anchor. Prior to KTVK, Mike worked in Monterey, Sacramento, San Francisco and Los Angeles. He also spent 10 years as ESPN's water-sports analyst. But music has always been Mike's first love.